The following are items that I use in my cheese making, these are just things I like to use and are my own choices. 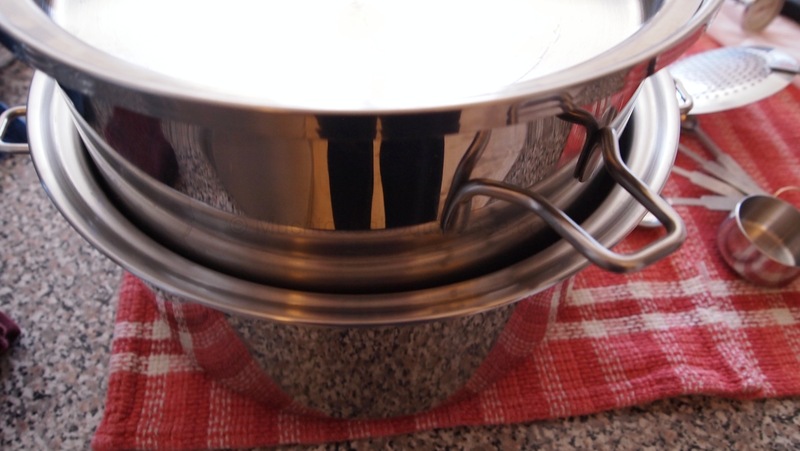 My Double Boiler Vat – I also use a big stock pot and have a 20 quart/19 Litre Stainless Steel stock pot I make cheese with as well. Any pot will do as long as it is non-reactive i.e. stainless steel. 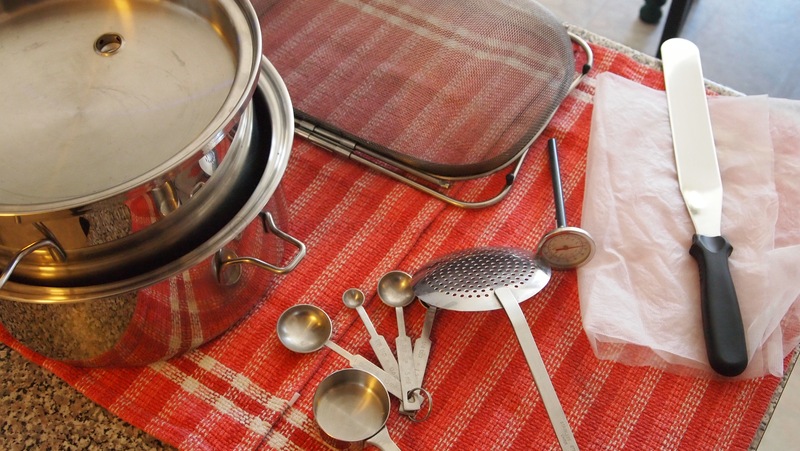 Equipment/Items – All utensils are either stainless steel or plastic, most can items you probably have at home already. Curd Knife – this is just a long cake spatula that works like a charm. It should be as long as your vat is deep. I would love to get a cheese harp, but I can’t find one I like. UnBleached Cheese Cloth – I go to a fabric store to buy mine or you can order synthetic cheesecloth online. The stuff you can get at the grocery store is too thin and will not hold up for multiple. Dairy Thermometer – This took me a while to find, but it was worth the hunt. 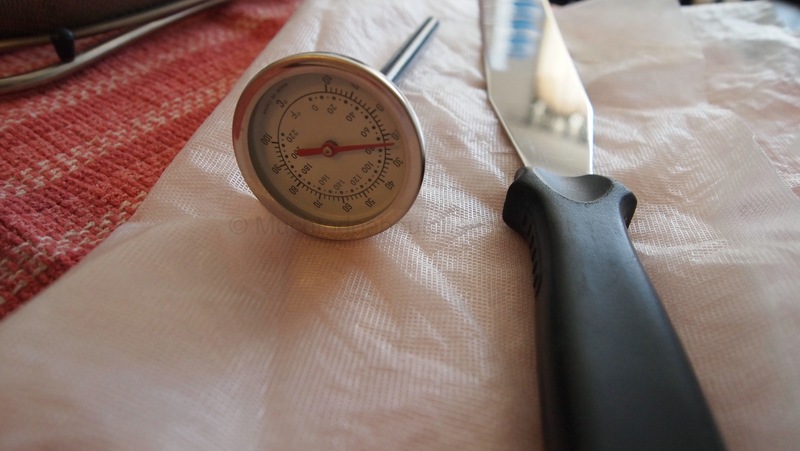 A candy thermometer will not do the trick. I hold mine in my hand so I can take readings from all over the vat. 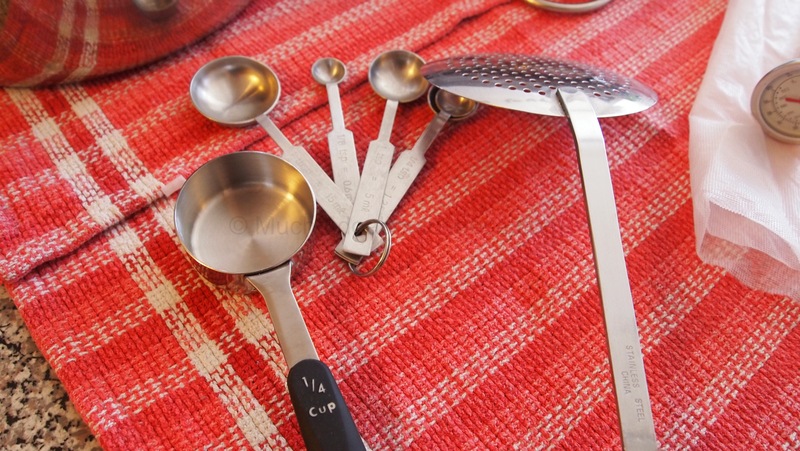 Measuring cups and spoons – they don’t have to be fancy, just accurate. Everyone has measuring cups and spoons. 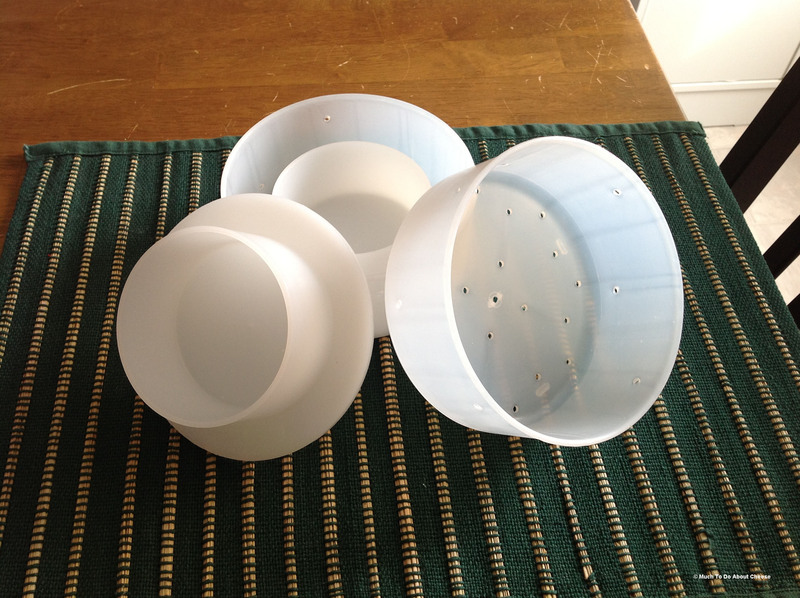 Colander – I found this one at a thrift store and it works like a charm and only cost me $1. 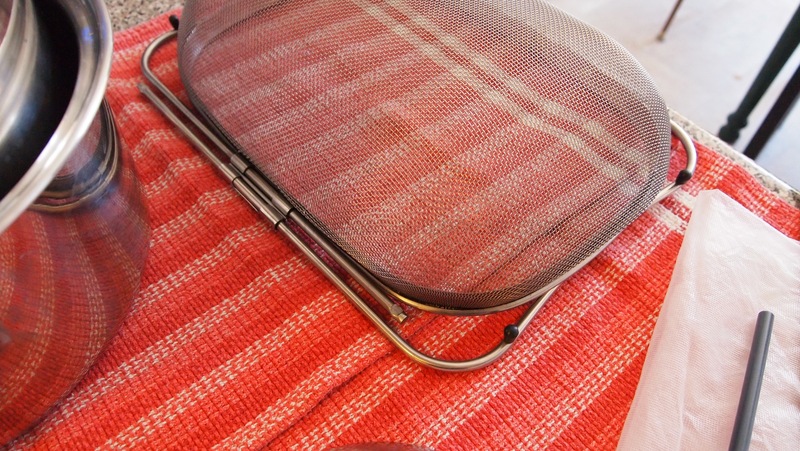 This colander/sieve has arms that expand out so it can rest over a sink. Draining/Drying Mats – I use plastic cross stitch mats that I buy at a local craft store, make sure to sterilize them before use. 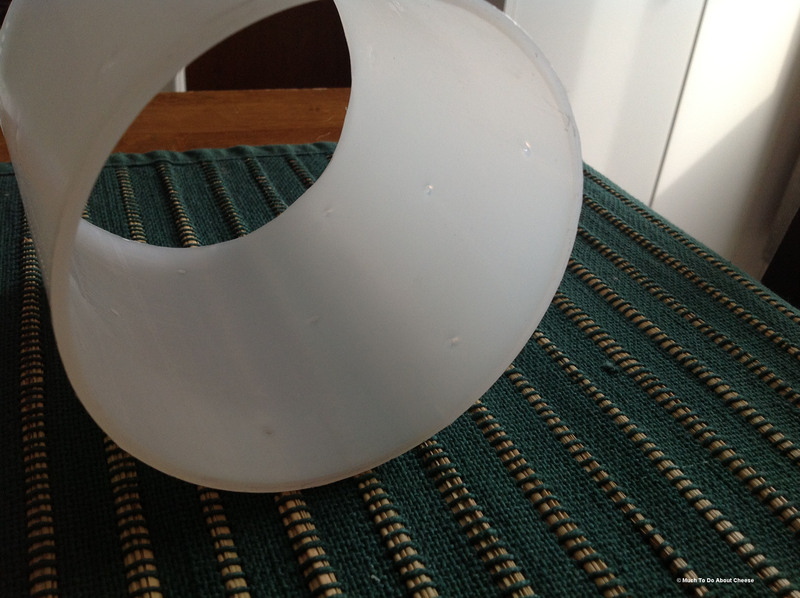 Various Cheese Moulds – You can buy yours or make them as long as they are food safe. 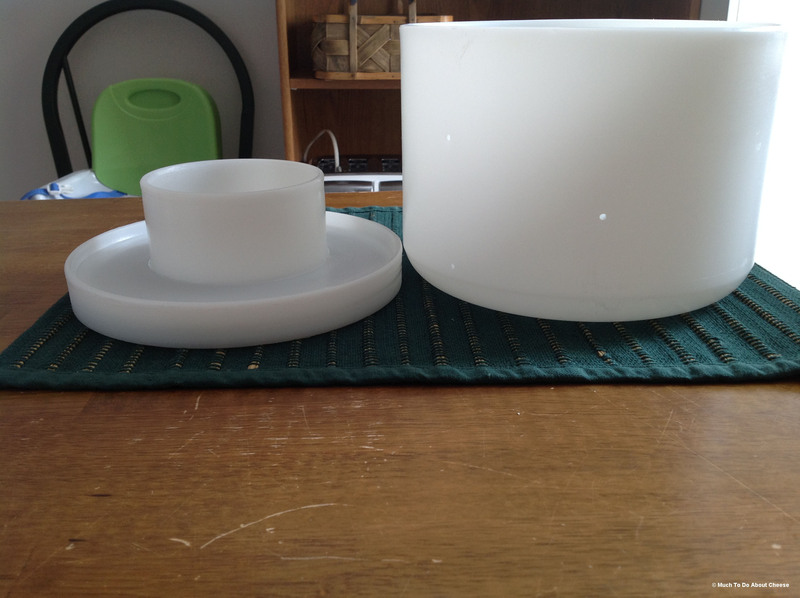 Tapered Crottin Moulds, They give a nice barrel shape to cheeses. This is an AOC Compliant Camembert Hoop. 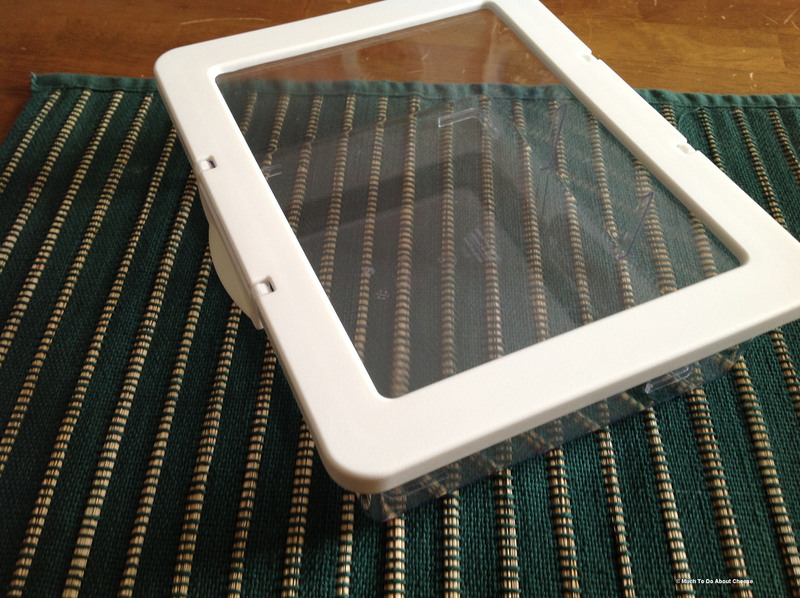 This is my large Cheese Mould, it can handle 1.5 to 3 kg of Curd. My average make is 1.5 to 2 kg. 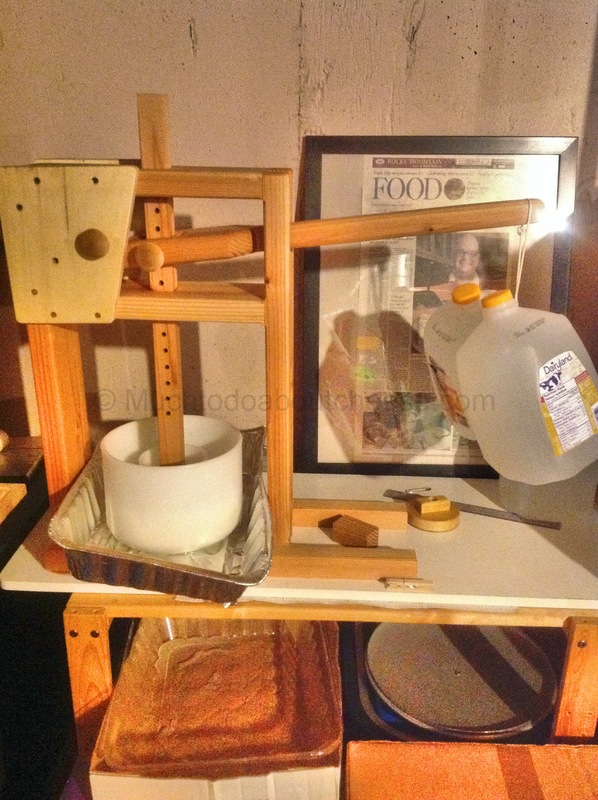 Cheese Press – Technically I have two. One is a hard wood top screw model that I was given for Christmas in 2010 and the other one that I bough and is a dutch style press. This is a Sturdy Press, a modified Dutch Style Press. There is a link to the manufacturer in the supplies section. 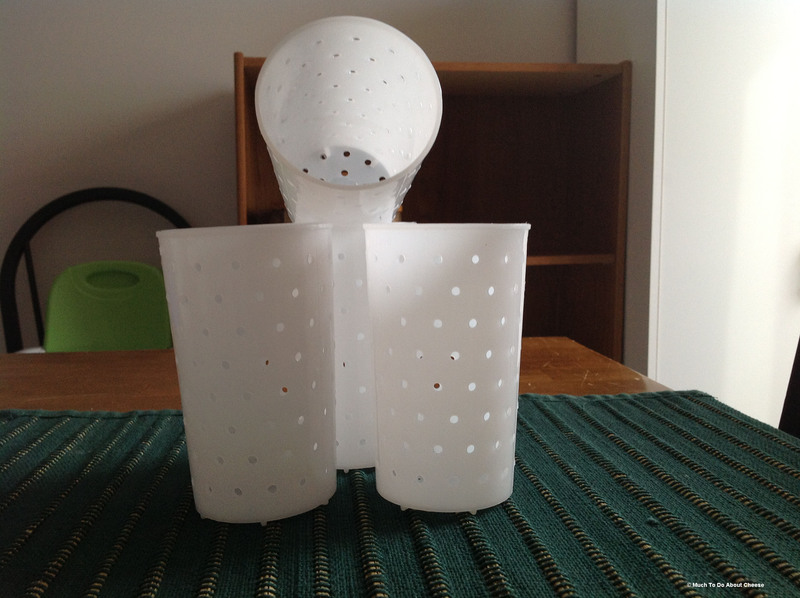 Draining/Drying Rack – This again is a new addition, it helps to get your cheese in a place that has good air circulation, also it allows you to place a bin under the rack so any whey can drain into it. Ripening Boxes (mini-caves) – these help you to control humidity and prevents cross contamination from mold ripened cheeses to your other ones. I am probably forgetting some items, I will add to this as I go along. I do use a digital thermometer from time to time, I just like my old school dial dairy thermometer a little better for some reason. It is all about what you like and what you feel comfortable with. Can you tell me if you just use the electric roaster just the way it is, or did you have to modify it in some way? Thank you, you can check out the post I did on how to turn the roaster into the vat, mine only holds 14L so I still make larger batches in a double boiler. Here is the link to the post. Hi, could you please tell me the dimensions of your ripening box and brand? Thank you. I don’t really have a specific brand or size. 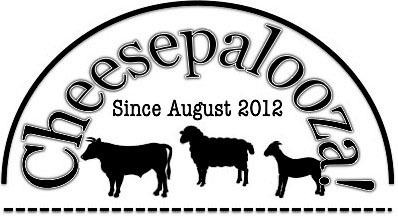 I just use food safe containers that are large enough to fit the cheeses that I make. I have some that are 6 x 10 x 4 and others that are smaller and some that are larger. Can you tell me what/how you sterilize your draining/drying mats? You can boil or steam them. But you can also soak in a solution of 1 teaspoon of bleach to 4 litres of water. You have to let them air dry.